This will come as no surprise, we are sure, but the summer holidays are grinding to a very sudden end! This means rushing, preparation, panic, confusion and for some, knee-jerking excitement/fear as the new school year looms closer by the day. Yes, ladies and gentleman, it is #BackToSchool time. This means it's time to boot up those computers and return your tanned fingers to the keyboards, as you look to stoke the social media fires that have been slowly glowing duller. What's that? You've forgotten what a Tweet is and all your Instagrams seem to be of half a thumb? Don't worry - we've got you covered. What does social media do for me? Social media is the perfect way to create an accessible, engaging and dynamic community. Your community can include staff, pupils, parents and prospective families. It is the best way to be able to reach all of these people, but you do have to be fully committed to make the most of it. One of the most exciting aspects of having a good social media presence is the three-way relationship that you can build between pupils, parents and your school. Why is this important? Well, first of all studies have proven that involved parents will have a greater impact on their children's education. If you have a platform where parents can see their children's work and exploits at school it can lead to driving involvement up. Secondly, you are offering a service where parents can communicate easily with the school. So longing as responses are punctual and helpful the level of trust between parent and school will grow. This will mean that your school's brand and reputation will also grow in the local, physical community (remember, people talk 😃). does your social media page reflect your school's theme? In other words if you advertise your school as being traditional is this represented by the style of your page's headers, icons and images? Or if your school is known for being highly creative in the arts is this reflected? do you have a brand message? Consider your website; what is the core message you are trying to put across, and does this translate across your social media? Again this is about consistency but specifically focussed on putting your school's value(s) out into your community. if you have multiple platforms are they consistent with one another? Is your naming strategy consistent throughout? Does each social media outlet have the same school crest as it's profile picture? Do the headers match or follow a theme of sorts? If the answer is no then it would be highly worth making some small, simple but effective changes. Check out the video below from Wimbledon High School - it is a fantastic example of their core message "Imagine" and is the first thing visitors will see on their school website. Now look at their social media sites for Facebook, Twitter and Flickr, alongside their website landing page. They have theme and the school's core value (Imagine) consistently throughout. This is what you should be striving for! Know your social media platform. Having a strategy is of course very important but absolutely fruitless if people aren't following you. It is time to think about how you can begin to drive your list of followers up. Luckily we have pulled together some cool ideas that will quickly engage more parents to follow you. Yes, sounds simple enough but putting your social media handle or school-related # onto things is an effective way for parents and pupils to know that you have a presence online. How about using chalk and tagging your school asphalt or pavement for the first day back? Or creating some merchandise that parents can buy - t-shirts, frisbees and bags being some simple items to arrange. It doesn't need to cost an arm and a leg and the end result can be a thriving virtual community for you to oversee. Have a raffle, with prize winners to be announced on social media. Nothing will get people following you faster than the promise of a prize! Yep, even social media can benefit from the old-school methods. Posters, leaflets and actual newsletters can be employed to make people aware that you are also online. Boost hype by developing a large first-term campaign - all details to be revealed over the weeks on social media. A bit more specific but the Snapchat Geofilter is an amazing way to engage the younger parents and their kids. 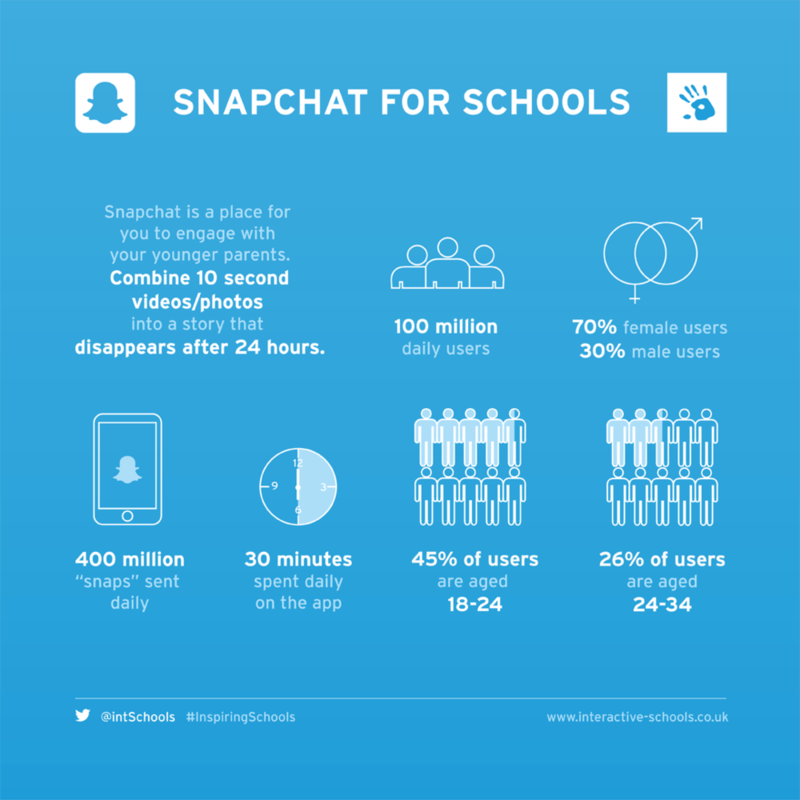 Snapchat is incredibly popular with 13-24 year olds. Geofilters work by being an overlay image on the Snapchat application - specific to a geographical location. You can create one for as little as £5 and specify a date range when this will be available. This guide explains everything is greater detail. Employ Snapchat Geofilters and really show off your ability to be part of the digital world. With the basics being taken care of, and your list of mums and dads growing by the second, it's time for the fun stuff: what you can post across your platforms. The short answer is (pretty much) ANYTHING. The core thing to remember is value. ALWAYS VALUE! How about considering a few of these ideas? Build excitement around the first day back: obviously time is limited for the actual #BackToSchool date but you can start building excitement with a few simple posts. Perhaps introduce new staff members and bid fond farewells to those who departed at the end of last term. Post an animation or short video recapping the previous year with the tag line, 'Let's make this year even better.' Announce the fantastic A-Level and GSCE results that are now out. Be innovative and have some fun - it will translate to interested followers. Cheat-sheets and handy instructional videos: for the less tech-savvy how about a video or animated guide showing them how to sign up on social media, post questions to the school or even turn on notifications so they can be alerted to your school's posts as they happen? Success from the pupils: 90% of parents who follow your feeds are likely wanting to see their child doing things and being successful. Promote this, it will be one of your greatest assets. Parents will be happy and you will effortlessly build an archive of images and videos for prospective families to view. 1. Does your marketing STAND OUT? What will make you different to your competitors? This is all about being that needle in the haystack; the big fish in the big sea; the diamond among the rough. This is the essential part of the strategy and so much of it boils down to creating an emotional impact on the end users: parents, pupils and prospectives. 2. Does your social naming match throughout? This is one of the ways we believe will make your social media STAND OUT and makes it easy for anyone to find you across all platforms you operate on. This point is covered in the 'How to Get Started' segment. Remember, it is so incredibly important to aim for a consistency with your social media. This may require making some small changes (i.e. ensuring all social media profile icons are the same) but it will equate to a big difference. If you don't have one then make sure you define one. This will essentially be a one-stop guide for you to refer to when considering the coming social media marketing plan. 4. Is your process to communicate with parents streamlined? This isn't just about responding to queries raised by parents via social media; it is about how you get information to them. One great way to make a huge dent in this process is asking parents to turn notifications on for your profiles. This will ensure that when you post they will see it. 5. Finally, do you have an audit process in place to make sure content is only published once? Nothing looks more unprofessional that your feed filled with the same image because too many people are trying to post at the same time and it was not clear who was doing what. We recommend using scheduling tools such as Buffer (you can read our guide to using Buffer here) so that multiple people can see what is being queued up for publishing. All this may seem simple to some and unreasonably complex to others - that is only natural. What we want you to take away from this is we are here to help! 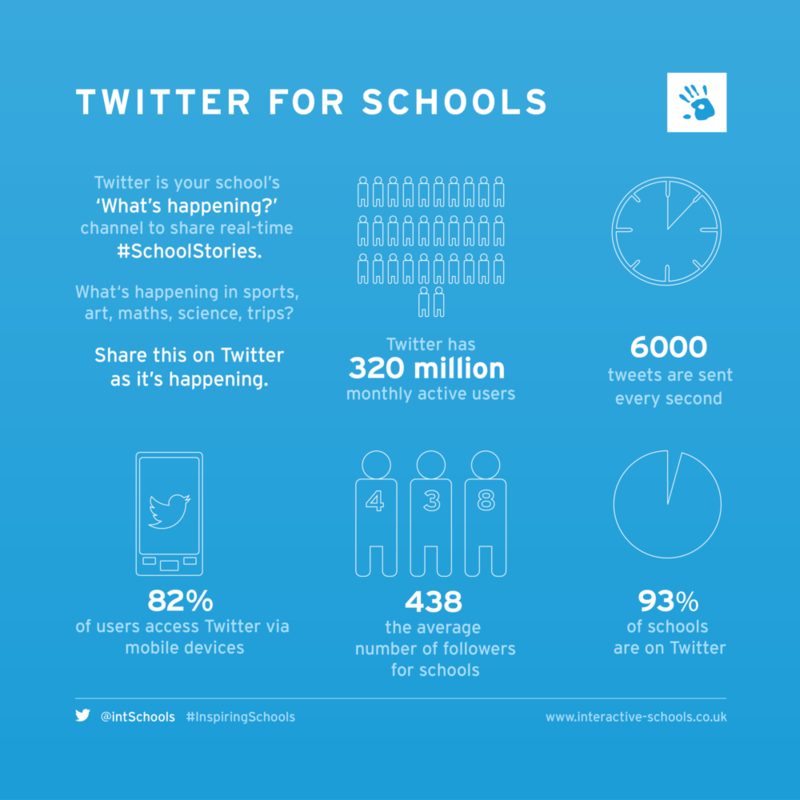 This is what we do as a company; our mission is to help schools STAND OUT online. We would therefore love to invite you our intSchools LIVE event - 5 cities, 5 days, #coffee. From 19th - 23rd Sep 2016, Interactive Schools CEO & Founder, Simon Noakes will be taking to the English roads, so you can talk to him personally face-to-face. This is an amazing opportunity to ask him anything about social media marketing in schools. To book an appointment (60 minute slots) click the button below. Otherwise we are here to help in any capacity we can. You can head to our website and fill out a contact form with any queries you may have, or send us a query in the comments box below. Sign up with your email address to receive our weekly schools marketing newsletter. We hope that this guide has aided you in your #BackToSchool preperations. We'd love to hear some of your stories, comments or thoughts about social media marketing and this article. Comment below. Does mindfulness have a place in schools?